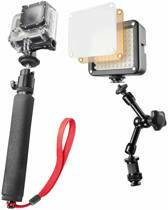 The Basic Set for the GoPro is ideal for entering into the sphere of professional filming with the GoPro. The vast amount of ╝ inch threads in the Aptaris Cage, which exactly fits the GoPro, gives you the opportunity to mount useful accessories all around the Cage. This way the Aptaris handle can also be flexibly mounted. The dimmable walimex pro LED video lamp is already included in the set and enables professional filming even under poor light conditions. 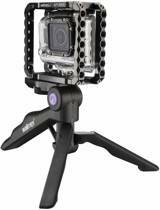 walimex pro Aptaris GoPro Hero has been specially developed for GoPro Hero 2 and 3 and thereby matches the camera by 100 %. Aptaris is thereby fastened to the GoPro housing with just a flick of the wrist and is then ready for any use in action. 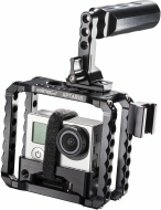 Aptaris not only offers you additional protection for your GoPro, but, with its large number of 1/4 inch threads and the 2 3/8 inch threads, also enables the attachment of accessories on all sides. For exciting perspectives or near ground level filming you can also attach a handle - either from underneath, at the top or at the sides. Aptaris gives you highest flexibility, irrespective of the type of use. Due to the outstanding fitting accuracy you still have unrestricted access to all control elements. And another special highlight: The GoPro housing can be opened and the camera removed, without having to dismount the cage system. Developed in cooperation with the German manufacturer SIX, Aptaris convinces with highest accuracy in workmanship, outstanding material properties and well thought-out engineering. Continuous quality inspections ensure premium quality and extreme longevity, even under highest loads in permanent use. This is supported by exceptional material properties: Aptaris is made of extremely light aircraft aluminium and stainless steel. 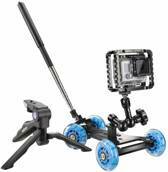 With its weight of only 110 g, Aptaris GoPro is very comfortable in use and also very stable. Thanks to the black anodizing Aptaris additionally scores with its noble design. Handle with L-angle included. The walimex pro Swivel Arm is a multifunctional, flexible helper that should not be missing in any studio. The bracket, which is 28cm long, is equipped with three joints, two of which come with high-quality ball joints. This allows you to realize individual positions. The central locking wheel in the middle of the hinged bracket is particularly convenient, as it allows you to adjust and lock all three joints at the same time according to your requirements. You are also flexible redarding your connection options. Two 1/4 inch screws with thread adapter and flash shoe adapter are at your disposal. 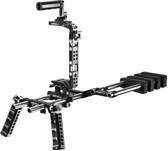 The Swivel Arm also offers flexibility in its use: it is ideal for the use with DSLR rigs and dollies. 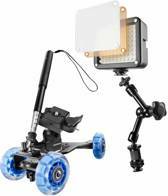 With it, you can attach video accessories such as video lights, monitors or microphones to your rig or dolly. The joints allow you to arrange the hinged bracket as needed. Additionally, the hinged bracket can be used on shooting tables, in order to realize unusual positions, or for unique perspectives on tripods and autopoles. The high quality materials ensure the necessary stability. 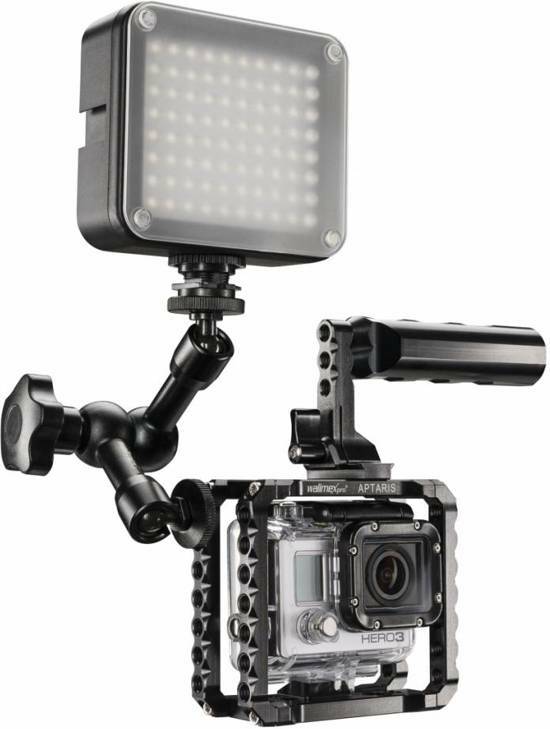 The Video Fluorescent Light from walimex presents itself as compact and self-confident device, which convinces every hobby filmer and videographers with its 80 powerful LED. The Video Light, which will be operated through 5 AA-batteries, is ideally suitable for all camcorders and video cameras. The 80 steplessly dimmable LED provide a high light output and therewith the necessary brightness for insufficient ambient light. This is particularly convenient for shootings in the dark or inadequate lighted rooms. Thus, you do not need to fear badly illuminated films anymore! The Fluorescent Light can not only be used in portrait and landscape format, but it is also flexibly extendable through the sophisticated construction. The device, which will be mounted through the flash shoe, can be connected with other video lights and then e.g. upgraded to a bigger fluorescent light. Furthermore, we offer optionally available mounting brackets, on which you can mount the Video Light in certain positions and in connection with several lamps. Therewith you can realize the plus in brightness. The Video Fluorescent Light is enduced with a 1/4 inch thread and have 580 lux. Alles wat iedere fotograaf, cameraman of cinematograaf nodig heeft kun je vinden bij Walimex. De producten van dit merk zullen je inspireren en de mooiste beelden laten creëren. Beginner of professional? Dat maakt niet uit. Voor iedereen heeft Walimex het juiste product. Om aan de verwachtingen van deze creatievelingen te kunnen voldoen heeft het merk accessoires in verschillende prijsklasse. Ben je opzoek naar een lensje voor je iPhone of juist naar een complete uitrusting voor je studio? Bij Walimex kun je het vinden. Het Duitse merk streeft ernaar de hoogst haalbare kwaliteit te leveren. Elk product is dan ook ontwikkeld en geproduceerd door vakmensen. Ontworpen door ervaringsdeskundigen en geproduceerd met precisie door vaklui. Een accessoire van Walimex zal lang mee gaan en is een investering om jouw foto's of films naar een hoger niveau te tillen.